Qualified teacher. Research activity at the University of Hanover. Business consultant for information technology. District councillor, Northeim (until 1996). PSE Group coordinator, Committee on International Trade (INTA). Member, Steering Committee, WTO Parliamentary Assembly. 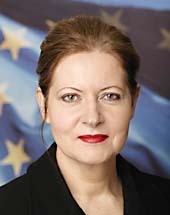 Member of the European Parliament (since 1994). Senator, Max Planck Society (MPG). Board Member, Max Planck Institute for Solar System Research, Katlenburg-Lindau. Board Vice-Chairwoman, Frauen geben Technik neue Impulse (women promoting technology) Association. Board member, International Foundation for Research and Exchange (IBB). Patron, Erika Mann Primary School, Berlin. Chairwoman, Transatlantic Policy Network (TPN). Member, Board of Directors, Salzburg Seminar. Member, Board of Directors, Internews Europe. Chairwoman, European Internet Foundation (EIF). Executive committee member, Kangaroo Group. Member, International Informatization Academy of the United Nations.